Here came the massive electoral promise from BJP in Odisha on April 13. “BJP, if it comes to power, will provide 5kg of Rice, ½ Kg Dal and ½ kg salt for Re 1.” Union Minister Dharmendra Pradhan made the announcement, in an electoral address, in Choudwar. Mr. Pradhan said, about 3.26 crore people of Odisha will avail the subsidized ration package under the National Food Security Scheme ( NFSA). At present this number of beneficiaries are availing 5Kg of rice each per month at a subsidized of 1Re per kg in Odisha. The 1Re-Rice scheme is seen as a high-yielding electoral plank, playing a pivotal role in Naveen’s successive electoral wins since 1999 though this is a purely central sponsored scheme with a minuscule state top-up of Rs 2. 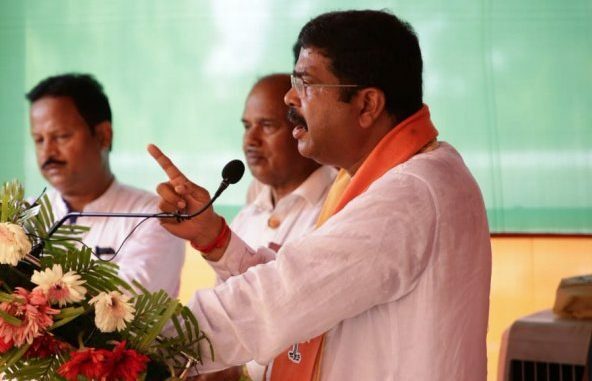 Besides claiming its stake of credit in the scheme, Mr. Pradhan announced an additional slew of promises while addressing a gathering in Choudwar under Cuttack- Choudwar assembly constituency that is under Cuttack Parliamentary Constituency. He promised, Scooty for the meritorious girls after +2, pension for laborers after 60 yrs of age, interest-free loan for farmers and loan waiver for SHG. Rs 15000 salary for the Anganwadi workers and RS 9000 for the Anganwadi assistants are the other two significant announcements by Mr. Pradhan. He said that on coming to power, BJP will revive OTM and Titagarh Paper mill in Choudwar with an investment of Rs 1,000 crore; and it will work to re-establish Choudwar industrial strength to make it a world-class production center. The first phase of election, in Odisha, has been finished on April 11. April 18, 23 and 29 are the dates of subsequent polling in Odisha.